Curtis CordFew people in the world have spent as much time on the olive oil front lines as the master merchant and renowned cheesemonger Steven Jenkins. His Cheese Primer won the James Beard Award and is often referred to as the single, most indispensable book in the world of cheese. He also happens to have a thing for olive oil and during his 36 years at the food helm of New York’s legendary Fairway Market, he got New Yorkers to stop, take notice and taste his vast selection of private label and branded oils. From the farms and mills, Steve and his staff visited and cultivated over countless road trips through the back roads of the earth and beyond but like all good things come to an end, a few years ago, Fairway was bought by a private equity firm and spun off in an IPO. Expansion was too fast, at least that’s my take on it and shares that used to be around $30 slid to 30 cents. Needing to shed expenses fast at any expense, the new management made Steve Jenkins — the food soul of Fairway — an offer he couldn’t refuse and he walked away. 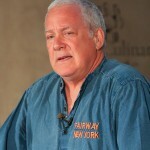 During his tenure, Fairway enjoyed one of the highest sales per square foot among food retailers. Now the brash, innovative signs that Steve and his staff maintained to educate New Yorkers about the foods they were buying are coming down. His commanding character and renegade style of customer advocacy has faded from the gourmet isles and cheese counters and Fairway is a wash in the viciously competitive New York market without the visionary merchant who spoke to us about food. Anyway, that’s how I see it and I won’t ask him to comment on any of that so now he’s taking a much-needed break, fielding some offers, doing some consulting work and graciously let me impose on his day to check in with him. Steven joins us today from New York. Welcome my friend. Steven Jenkins Curtis, good morning. Curtis Cord How are you doing? Steven Jenkins I could not be better. Thank you. Curtis Cord If you were Mark Bittman, you’d be saying goodbye to your customers for another six months at least. Steven Jenkins I can’t believe you just said that. Curtis Cord But you just sent out a text to a few friends that said, “I’m out of here.” There was a blurb in The New York Times. Have you had any closure? Steven Jenkins No. I really haven’t. It’s the strangest thing that’s ever happened to me. It’s like you wake up one morning and suddenly everybody is saying, “Well, you’re so old. It’s time for there to be a whole different thing going on now whether it’s your life or anybody else’s. Go on, get lost.” I’m going, “How strange this is. I had no idea that I’d stayed too long at the Fair.” But apparently I did, I have all these younger people who think they know better than the old guys. I guess life is just that way and you just have to accept change and embrace it. I always say that change is good but I never thought that I wouldn’t be helping drive those stores that we call Fairway Market. It just happened right out from under me, just “whoops” I had no … I just didn’t see it coming Curtis. Curtis Cord Cheese and extra virgin olive oil. Obviously, they’re a match made in heaven but is it their complexity that captured your interest? Steven Jenkins I’m embarrassed to tell you the truth. What caught my attention with olive oil was the same thing that caught my attention with cheeses. My cheeses started in the mid-70’s throughout the 70’s, 80’s, 90’s but then came the 90’s or the late 80’s anyway and I began to pay attention to olive oil just because of the labels. It was the labels on all of those little cheeses most of which were coming from France that I was smuggling in in the 70’s and 80’s. It was those little labels that were so such a throwback to a time when a label really meant something. I began to see great labels on bottles of olive oil and they intrigued me too. I was such a dope that I really didn’t know what was going on inside underneath the label of the cheese and I didn’t know what was going on behind the label on the bottle of olive oil. All I know is I dug labels, I dug the shapes of bottles and I just loved the whole idea of there being this magical liquid in a bottle that you could purchase or take home and call your very own. I’ll tell you Curtis, another 15 years went by before I had a clue about olive oil. At least by that time I understood cheeses in the nature of cheeses and had committed to memory a thousand different cheeses to my idiot mind, I had a good retention capability and I found I did the same thing with olive oil. I recognized brand names, I began to recognize specific regions that they came from. I still didn’t recognize anything about the aromas and maybe the occasional flavor. I put a great deal of stock in aroma in fragrance more so than I do in flavors of olive oils but we’ll talk about that another time. What I’m doing is I’m confessing that I faked it with olive oil for a good 15 or more years before I finally turned on the lights and began to understand the nature and privilege of olive oil. I’m way late to this party about being able to speak authoritatively about the nature and beauty of olive oil. Curtis Cord It started with you are a sucker for packaging. Steven Jenkins Sucker for packaging. Sucker specifically for the labels that were as exciting to me as the labels on all those wonderful little French cheeses, cows and goats of cheeses. They just turned me on. I had no idea what was in the bottle or what was underneath the label on the cheese. Curtis Cord I live for years on the upper west side not far from the flagship fairway and even back then, you had a mind numbing selection of oils from far and wide and there among the germaphobic New Yorkers you had dipping bowls with the different oils and nice crusty artisanal bread. I used to watch in horror as homeless people would belly up to that bar and satisfy their daily caloric intake with crusty rolls and fancy olive oil. What were you thinking putting out free food in New York City? Who does that? Steven Jenkins It wasn’t that. It wasn’t like that at all. I watched every single person that came and went from that area and I was over-attentive about making sure it was perfectly hygienic. You’re hysterical. Curtis Cord Do people know more about olive oil than they used to? Steven Jenkins No, they don’t. All they know is what they read online most of which is garbage and what supposedly authoritative food friends of theirs tell them things like, “Oh the best olive oil comes from Tuscany.” They’ll buy them and they’ll run with the phrase like that and it will dominate their thinking. As did nothing dominate my thinking for all those years because I didn’t have any information. People are so easily influenced by somebody who purports to be in authority on any given subject but certainly olive oil. It’s just terrible. No, people don’t know anymore now here in 2016 than they knew back in 1986 about olive oil. At least that’s my experience and nobody talks to more people than I because of 150,000 people a week going through two stores of my 15 and I would talk to so many of those people on a daily basis. I’m telling you, they’re as ignorant today as they were 30 years ago. Curtis Cord I’m afraid I see it the same way you do. How do we change that? Steven Jenkins I’ve got to get out there on the hustings and talk about this more often. I only get a couple three opportunities to speak a year. I should be out there on the road while singing the praises of how important it is to know this, this, this and this about olive oil and I’ll change your whole way of thinking about what you do in the kitchen with your most important ingredient in your kitchen which is the fat you use to translate the fighters and physically to cook various ingredients but it’s the fat that you use in the kitchen that defines what kind of a cook you are. It’s either butter or it’s lard or it’s olive oil. Curtis Cord There’s never been an effective spokesperson for olive oil. Then you got this guy who’s shilling for the California olive oil industry and it’s just … As I say it’s just so unfair. No, there has not been anybody who can speak for the beauty of olive oil and the truth about olive oil because frankly, most guys and gals that are in this industry are like any other industry like real estate or the garment industry or whatever. They’re not very passionate really or unable to transfer their passion from their brain to the public about what it is we do in the olive oil industry and why it’s so enduring and permanent and unchanging. There’s just some very basic things that people need to understand about olive oil in order to move forward as a cook and as a person who appreciates the finest things in life of which olive oil certainly is. Curtis Cord There’s never been a shortage of bad news about olive oil and this is my first podcast since that 60-minute segment on how the mafia has been making a killing passing off bad olive oil as Italian extra virgin. How much of an impact do you think these exposés have on people’s buying decisions because on the other side, everyday you’ve got new studies, new research, new reports coming out about all of the health benefits of consuming extra virgin olive oil but it’s almost like people don’t hear the good news. They only hear the bad news. It’s almost like the current presidential campaign. Steven Jenkins Yeah and it bugs me that the media is able to get away with this stuff in the olive oil industry the same way they do in politics. They just don’t tell the real story and the whole story and the true story. They report what they want to report. These are not journalists, these are hacks, these are pundits, these are people who are masquerading as truth sayers while indeed what they are is partisan. The whole thing that just happened with 60 minutes Curtis for me … what astounds me and I’ve told you this, it’s like Groundhog Day. This is just a repress of a year ago when the whole Tom Mueller thing came out, it was the exact same story with the exact same people on both sides of the ocean and nothing new really had happened except they went back to the bottom feeding supermarkets and pulled a bunch of bottles of olive oil that should not have been in anybody’s kitchen in the first place and tested them. Of course found out that they were oxidized in the bottle seal that they were not 100% olive oil. We already know this but the media cast this as a reflection of the entire industry where indeed it’s just that small segment of American supermarkets that always go out there and buy the cheapest of whatever commodity it is they want to put on the show so that they can make more money. They could mark it up to a descent mark up on based on what they paid for that olive oil but that olive oil is garbage to begin with and that’s part and parcel of the whole supermarket industry or any other industry that is a bottom feeder and you’ve got to understand that supermarkets don’t care about food, they don’t care about you, they don’t care about their jobs that much, they’re not passionate about it. They don’t want to be able to say I am the very best in the universe at this particular part of the food industry and they were encouraged to them. You as a customer who walk in the supermarket, there is nobody in that supermarket that can talk to you about food. In any department certainly not olive oil but once again, here we got these California guys who create this ruckus that’s absolute carbon copy of what happened a year ago or whenever that was when they did the same thing and everybody’s acting like it’s new. It’s not new. It’s the same old, same old. It’s the American, the North American supermarket industry that chooses to put stuff on their shelf whether it’s olive oils or anything else that is the cheapest, lowest quality that’s out there because that’s what’s going to sell. They’re going to be able to sell olive oil for $5.99 a liter which is absurd. It’s absurd. At four times that price, olive oil still ranks as one of the greatest values in the entire realm of gastronomy. Here you’ve got supermarkets wanting to sell six bucks a liter, eight bucks a liter and suggest to you and me that this is the real deal. It’s not the real deal. It’s as phony as the day is long but that doesn’t give you the right to say everything that comes in from Europe, from the Mediterranean basin is going to be low quality, it’s going to be fraudulent, it’s going to be oxidized. That’s absolutely a fallacy and I for one am outraged that these writers are getting away with this. I’m even more outraged that these people at U Cal Davis are able to put together the California olive oil board and actually with a straight face put it across to the north american public buying public that you’re better served buying California oil because you can trust us. You can’t trust the European because, “Look, here we’ve pulled another six bottles off of this rat hole of a supermarket that has so-called extra virgin olive oil for sale for six bucks.” A leader. It’s an outrage. We need to get that message out there. Curtis Cord An American still consume a shamefully small amount of olive oil on average despite endless reports, serious reports that high-quality olive oil can improve and extend lives if you just eat it instead of refined seed oils but it takes a long time to change habits does it? Steven Jenkins It does. Indeed and we do experience a little bit of growth in olive oil consumption and I’m the one that ought to feel it because I’m on the firing line of retail where I see what people are buying and what they’re not buying and I guess New York is just different. Everybody here is so olive oil-centric and so crazed for olive oil and olive oil is such a rock and roll thing that I lose side of the fact that out there in Nebraska, folks maybe just don’t care. They’ll pick up a bottle of corn oil or a bottle of canola oil and Bob’s your uncle but there are people who are more interested in the nature of things. In a big city apparently than there are out there in the hustings as I said earlier. Folks don’t see the rock and roll joy that you get from great olive oil and that disturbs me but it’s changing and I’ll still bet you Curtis that those of us that choose to stick with it are going to prosper because olive oil is the future, olive oil is the food of the future. Olive oil is how you extend a happy life, free of disease, feeling good and you can’t say that really about any other edible substance in our lives. Curtis Cord How hard do you think it is for people to know a good olive oil from a bad one by tasting it? Why should people care? Steven Jenkins They should care because they’re fooling themselves if they think they can. You cannot taste olive oil and tell me that this is oxidized. Your tongue receptors and your olfactory receptors do not reflect oxidation. Anybody that says they can taste an oil and tell you whether it’s going rancid meaning oxidized or not is fooling themselves. That’s impossible. Secondly, they need to understand that olive oil is not a food. Curtis Cord Hold on a sec Steve, you’re saying that you can’t taste rancid olive oil? Steven Jenkins Nope. You can’t. Curtis Cord I can taste. Steven Jenkins You may think you can but you cannot. Your brain is fooling you. You can have about two samples right next to each other one that’s 50% oxidized and the other one isn’t and you will be flipping a coin tell me which one is oxidized. It’s impossible. It’s chemically and sensorially impossible. Curtis Cord You smell it. You smell the rancidity. Steven Jenkins I don’t know. The experts say no. You say yes. Curtis Cord You wrote in an article recently and I’m going to quote you here. A grasp of Mediterranean basin geography is crucial to understanding olive oil. Get your maps, go online for a map. If you don’t know where Partanna is in Sicily, you don’t deserve to have great olive oil. If you don’t know where Sicily is or Corsica or Crete or Caledonia or Sardinia, I give up. Steven Jenkins Yeah, I give up. Curtis Cord Come on, Steve. Really? Steven Jenkins Absolutely come on. If you can’t appreciate the terrain, how are you going to appreciate the content? It’s a one thing to say, “Well I’ve never been to Sardinia.” Lots of people haven’t been to Sardinia but do you know where it is? Do you understand anything about that sprawling island and how it might figure very prominently in the realm of olive oil? Do you know where Caledonia is? Do you know that it’s more than just Barcelona? Have you ever said to your wife or your husband or your best friends, “Let’s travel there. Let’s go see these places.” Until you have a geographic grasp of the Mediterranean basin, you’re never going to understand cooking, you’re never going to understand olive oil and you sure won’t get the appreciation that you deserve out of it. I’ve had you done some homework and had you educated yourself as to where these places actually are. Spain is huge Curtis, you can’t say I want a Spanish olive oil, it doesn’t mean anything. Same thing as saying, “Hey, I’m looking for a Spanish wine.” It doesn’t mean anything. Same for France, same for Italy, same for Portugal. These are areas within which. There are regions and sub-regions and they’re all different. They all have an identity and they all have a historical place in line of why that country resonates so loudly to those of us that appreciate European history and European geography. If you don’t know where these places are, you got no business even trying to parse one olive oil from another because you don’t have a grasp of the whole realm. Curtis Cord But you just said a second ago that olive oil is a condiment and that you can’t read into it too far with notes about this, notes about that, why does geography matter? Steven Jenkins Geography matters because all those cultivars, all of those varieties of olives come from a specific place and they have a specific fragrant and flavored profile that if you really stick with it, you will be able to break them out. You’ll be able to taste a Tonde Iblea that’s tomatoey from a Coratina that’s like fresh cut grass. You’ll begin to get those sensations through your olfactory and you’ll be able to make those distinctions and you’ll also be able to pair up olive oils with specific foods which is a real frontier for those of us that are serious about olive oil. You begin to match up specific cultivars with specific dishes. A steamed branzino, seabass is very different from a grilled branzino. You’re going to want a different cultivar to anoint that fish based on how you’re going to cook it and the characteristics of that particular cultivar but let’s not get too deep into those arcane but wonderful things about olive oil. It’s more important that you understand that olive oil is not a food. It’s a condiment. When you taste an olive oil on your tongue and roll it around and then inhale and then do all that tasting stuff, you are going to find a cough if it’s the right kind of olive oil. It’s going to be an early harvest olive oil if there’s a God in heaven and it should make you cough and it should be bitter, it should be pungent. It’s not something where you’re going to go, “Oh, that’s so dried fruit. I get dried fruit, I get cooked …” it’s not a food. It’s a condiment. It’s supposed to make you cough, it’s supposed to be peppery. If it’s not, you need to put it back because that means it’s a late harvest olive oil. It has no polyphenols in it that do you any good and they don’t do the food any good unless they’re there. Curtis, it’s that bitterness that amplifies the flavors of foods. That’s why we seek early harvest olive oil and an early harvest olive oil is not going to taste like you’re tasting a wine so that you can make up comparisons to what you’re tasting in that wine that whacks romantic. When you taste a proper olive oil, that can’t happen because that olive oil is so peppery, so sharp, so piquant and a bit bitter that you would never dream of saying, “Oh boy, that taste good.” It doesn’t taste good. It tastes like what it’s supposed to taste which is an early harvest olive oil that’s going to be sharp, that’s going to amplify all those flavors in your food. If it doesn’t, it’s a late harvest olive oil, it’s going to lie on your food like a side of loss. Steven Jenkins You know why that happens? Curtis Cord First of all, you know I love smoked salmon, no need to dis my smoked salmon, Steve. Steven Jenkins I didn’t say smoked salmon. I said lox. Lox is picked salmon, it’s not smoked. Curtis Cord Okay. Late harvest olive oil is stupid Steve. Steven Jenkins Yes it is stupid and you know why? Because within 15 days after olives have been picked, the polyphenol level drops like a rock. Not like a gradual decline, it drops like a rock and when the phenols disappear from an olive oil it showed as olive oil’s intrinsic goodness disappear. You’re not going to have any of that bitterness that amplifies flavor and you’re not going to have the powerful free radical anti-oxidation of those phenols in your body. It’s a double whammy for anybody who’s shopping for olive oil unless you can see that there’s an indication that it’s an early harvest and it will be proclaimed in the label Curtis then you should put that olive oil back because it’s the product of a miller who wanted to pay his bills. He got more olive oil on the bottle, therefore he’s going to make more money but that olive oil is late harvest olive oil. It has no goodness, it has no magic, it has no appeal and it has no ability to transform the foods in your kitchen into what they are which is grown in your garden, your own garden or your own neighbor’s garden or your own farmer’s market. The best fruits and vegetables and meats and seafood cannot be saved, cannot be approved by a late harvest olive oil. Curtis Cord But I think a lot of the nice oils from Provence and places like Morocco, Tunisia, Lebanon are harvested later and they can be really delicious. Flow bodied and very complex but they don’t stay that way for long. They wouldn’t boast the polyphenol content of early oils and they sure wouldn’t be able to withstand the travel time to local markets here but if you’re over there, you taste some of those more ripe oils. They can be very nice with those local dishes. Part of it is because it has not completely degraded but bigger one. Bigger point here Curtis is that that’s what you are used to. You meaning all you folks that have a cousin down the road, your Italian cousin down the road that’s been giving you all your olive oil since you were tiny, since you were a little kid. You did the same thing. His mom and dad did it, your mom and dad gave them olive oil that he came from his own grove and you became inured to that crumby, lousy, stupid olive oil that he harvested way too late but that had not yet completely degraded. The phenols were gone but still the blood and the bones were in that olive oil so that you could at least taste some creaminess or some butteriness or some appliness that thrilled you and that’s what you became used to that your olive oil is supposed to taste appley and a little bit buttery. Curtis, that olive oil is not going to improve your food and it’s not going to improve your health. It’s just what you’re used to. We need to shatter the glass on this so that people understand. They think they know olive oil, “Oh, I’m Italian. I’ve been using olive oil all my life. My mom and dad always had olive oil, my grandparents.” You don’t know anything about what it is you’re seeking with olive oil because you’re so used to what’s been going down in your family. You’ve been fooled and you’ve been fooling yourself all this time. This is a revolution Curtis and you’re either on this revolutionary bus or you’re not but you’ve got to listen to me. Curtis Cord Who is an olive oil producer who impressed or inspired you? Steven Jenkins Oh my gosh. You’ve got to understand that before I retired last year, all of my Fairy Markets had over a hundred olive oils, 75 of which I import direct from the grove to me with nobody in between but the guy who’s packing my pallets. My freight forwarder is me, my customs people are me, my customs broker is me. I know so many people whose family endeavor has been nursing and curating their groves for all of their lives. I wouldn’t know where to start. I’ve got the 14 southern French oils by themselves from Languedoc Provence. You wouldn’t find more than three or four of the best shop in Paris or Lyon or anywhere else in France. You’re not going to find French oils but in Fairway Market, my God, you’d find 14 of them because I’m a maniac for southern and French oil. I love it and I know so many of those folks so well and I’m able to exhort them and cajole them into sending me early harvest oil only as opposed to their usual ripe olive oil which is a custom in France. It’s not from black or dark purple olives, it’s at least beige and brown olives which means they’re coming to ripeness. Even every region of Italy almost I can name a family that I’m close to that I respect so highly because of the devotion they give to their groves. Certainly the proliferation of regional Spanish olive oil families that I’ve gotten to know just over the last five years and largely and thanks to the olive oil times and Curtis Cord who have opened up North America to all these fabulous Spanish oils that are coming to us now. Regional Spanish olive oils have vaulted past Italy and France in terms of rock and roll and seriousness and the ability to market their fine early harvest oils to North America. It just vaulted past Italy and France. It’s really something to see. The answer to your question is more families are not going to imagine that I know pretty darn well and understand the lives they lead and the kind of people they are and how it never occurred to them in a million years to do anything but to go to the ends of the earth to provide the best olive oil they can whilst paying their bills, whilst paying themselves, whilst building up their groves and making them better for the next season while withstanding all the vagaries of being a farmer. My gosh, the problems these guys have, if it isn’t one thing, it’s another. Curtis, if it’s not hail, if it’s not rain, if it’s not drought, if it’s not a fly, if it’s not a mold, it’s something else. Now you’ve got the California olive oil board on our case spreading lies about us. These people cannot catch a break. Everywhere they turn, there’s something else to thwart them from having a successful harvest and being able to pay their bills. That’s another thing I wanted to say to you. The only way that you can come up with olive oil as good as the ones that I import is to spend a ton of money. Those machines cost so much money, the facility that you have to protect your olive oil from oxygenation, from being oxidized cost a fortune. There’s no artisanal virtue to the old tools anymore or the old facility, the old house, the spider webs, the dust, the dirt on the floor. It can exist in the same realm as the best olive oil in the world. We’ve learned that over and over and over. It cost a fortune to make really good olive oil. Curtis Cord I’ll tell you what impresses me. In about seven weeks, we’ll hold our fourth New York International Olive Oil Competition and if this one is like past editions, the judges will go through their 700 or 800 entries and find about 25 or 30% of them worthy of a coveted award, perhaps 400 or 500 will go home empty-handed but what really impresses me Steve is that there are 700 or 800 dedicated producers from 26 countries who strive for excellence to such a degree that they believe they have crafted one of the world’s finest extra virgin olive oils and one approved it. That is a humbling concept and I have such profound respect for these people. Steven Jenkins I just dance. I do a happy dance when I think about it. I was lucky enough to be at the premiere three years ago and the second one and the third one and it’s just … it’s like a rock concert or a festival, a music festival from 30, 40 years ago. It’s just the happiest, most exciting thing. The New York International olive oil competition thing. I’ve heard that it’s bigger than the last three. The first three it’s like 800 entries. It’s not cheap for these folks to have to send a sample and go through that thing and can you imagine going to all that trouble and then walking away empty-handed and you’re just crestfallen. It’s a lot of drama and it’s a lot of emotion. Curtis Cord The remarkable thing to me is that so many of these producers are carrying on what their mothers and fathers and grandfathers did and little did they know back then the health benefits that would come to be attributed to what has been their common fact. They didn’t know this stuff actually made you live longer although they might have had a suspicion. I’ve learned as the guy who runs that garden and who owns this kitchen that my tomatoes taste better when I drizzle an early harvest oil on them because it brings out the flavor more. The bitterness tends to amplify that brassy wonderful fabulous nature of that ripe tomato and when I do it instead with this olive oil that is a year old now and then I took from those olives way down the hill when they were almost dead ripe, I don’t really … I could eat this tomato by itself with no olive oil and really have a better experience. It’s not everybody that’s so inured to using late harvest olive oil that they think that’s the way olive oil should be. You’ll take a peasant like me and six times, six doses of an early harvest and six doses of a later harvest, sill me, the early harvest tastes better. It makes my food taste better and it just so happens I’m going to live 25 years longer because of that early harvest oil than I would on that late harvest. You’ll learn these things because you’re a thinking human being who’s not been classically trained why all these things happen to you when you taste an early harvest versus a late harvest. It happens because your brain is healthy and your brain sends the signal back to you, this stuff tastes better because it’s bitter and it’s sharp. That makes me really happy and that’s why I think there’s hope for the North American consumer to learn the nature of serious olive oil that’s going to make his or her life so much better. Curtis Cord I could talk to you all day about this stuff. Steven Jenkins We argue now and again but I think we only argue because I want revenge on these people that spread lies. You, Curtis Cord, tend to give them a break, give them a pass and let them get away with it. I say, “Don’t let these scalawags get away with this.” It’s outrageous that they would imply that European olive oil is going to be fraudulent and that if you want to make sure that doesn’t happen, you should only be buying California olive oil. That’s outrageous that anybody would suggest such a thing. Curtis Cord Yeah, there’s a lot of trash talking going on but in the end, science is the great leveler. You can test this stuff and you can pull a bottle off a shelf, you can test it, you can taste it, you can smell it, you can check its chemistry and in the end … it’s not just imported oils but in the end, chances are if you go to the supermarket and you buy a bottle of stuff that says extra virgin olive oil, there’s a great chance that what you bring home and feed your family is not extra virgin olive oil. Steven Jenkins Stay out of supermarkets. Find somebody in your community or as close as you can or on the internet that you can trust and you’re just going to have to understand that you’re not going to be able to buy olive oil that’s worthy for ten bucks a liter. It’s not going to be very good olive oil. You’re going to have to pay 15, 20, 25 dollars for a bottle of olive oil. Get used to it. Curtis Cord I’m seeing better and better selections at small specialty stores. For example, Italian delis, I’m seeing very nice selections, I’m seeing fresh oils, brought in from distributors and I think I’m seeing things move there. Steven Jenkins Keep an eye on that date. You’ve got to go … your eyes got to go to that label, put your glasses on so you can read those little tiny letters and find on that label where it tells you what year harvest it came from because if it’s more than a year, you need to put that oil back and not shop in that supermarket because they’re selling you a two-year-old oil and that’s just not the way it’s supposed to work. Curtis Cord I’ve got to let you go because I know you have another call but always a pleasure Steve. Curtis Cord Thanks Steve. We’ll be in touch. Steven Jenkins Hope so Curtis. Best to you.